Irritability, sadness, or apathy may signal another condition. Everyone has a bad day now and then. But if you or someone you care about seems sadder, more worried, or more easily agitated these days, it could be a sign of a more serious condition. "Mood-related symptoms can come and go in response to everyday stresses. If they occur for long periods, cause significant distress, or interfere with your daily functioning, it's an indication to seek help," says Dr. Nancy Donovan, an instructor in psychiatry at Harvard Medical School. 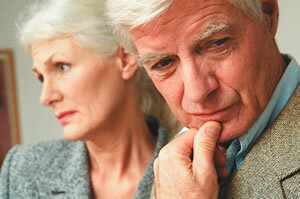 Changes in mood that occur for long periods may be a sign of depression or even dementia. Mood and stress are regulated by a number of brain structures, networks, and chemical neurotransmitter systems. Damage to any of those can show up as a change in mood. "For example, disease of tiny blood vessels in the brain can alter brain white matter. This may disrupt brain connections that are important for normal mood and behavior," says Dr. Donovan. Mood changes may reflect a psychiatric disorder. For example, depression may cause sadness, irritability, anxiety, and a loss of interest and pleasure. Mood changes may also stem from a medical condition, such as thyroid disease or a neurological condition. "In our neuropsychiatry clinic at Brigham and Women's Hospital, patients with dementia frequently come for treatment of apathy, depression, anxiety, and other behavioral changes," says Dr. Donovan. Sometimes mood can change because of a sleep disorder. Too little restful sleep can lead to irritability and anxiety. Or mood symptoms may be a medication side effect. For example, the steroid medication prednisone (Deltasone, Prednicot) can cause nervousness or alterations in mood. If you're experiencing a significant mood change that lasts for more than a few weeks, or if you notice this in a loved one, it's probably time to see a mental health specialist. A medical evaluation may include a person's medical history, a physical exam, and sometimes tests to gather images of the brain. If dementia is suspected, a neuropsychologist may need to conduct additional tests to determine if there is a significant change in thinking skills. Treatment for mood symptoms will address their root cause. For example, if it's depressive disorder, your doctor may prescribe psychotherapy, an antidepressant such as citalopram (Celexa), or both. If a lack of sleep is to blame, your doctor may prescribe a program of better sleep hygiene or refer you for a sleep evaluation. If medication is triggering mood changes, your doctor may simply switch you to another type of drug. The take-home message is that you shouldn't ignore symptoms. "Don't hesitate to talk to your doctor and go for an evaluation, because effective treatments are available for mood symptoms and their causes," says Dr. Donovan.